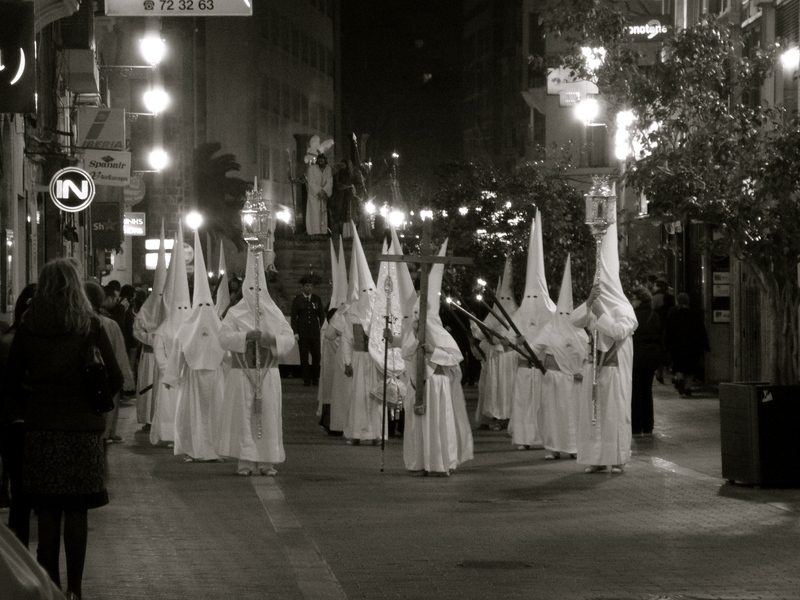 I’ve never made a secret of the fact that I love the way the Spanish celebrate Easter. 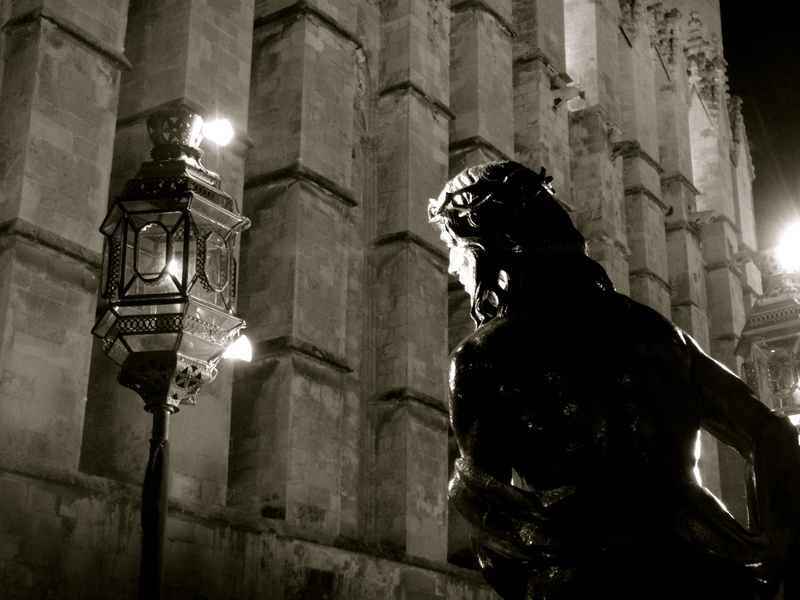 Their Semama Santa (Holy Week) processions are amongst the most atmospheric and moving sights that you will see in Spain. 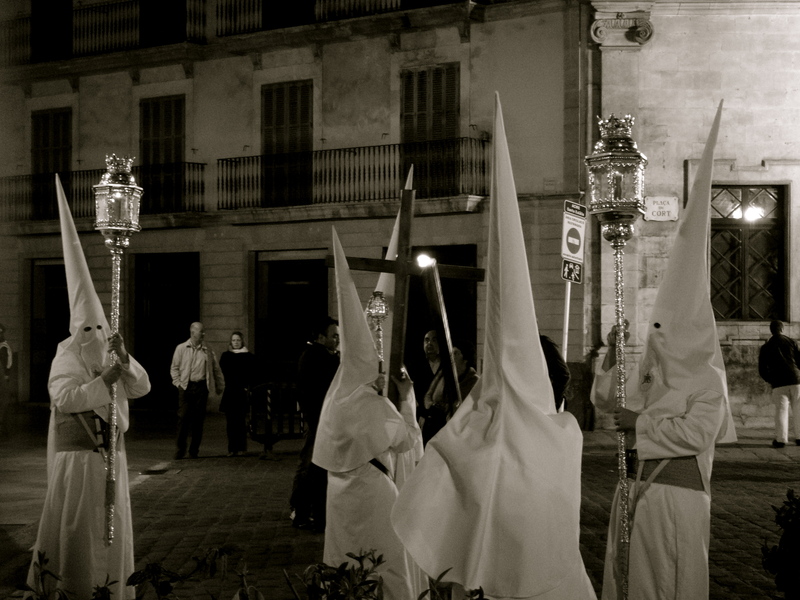 Originating in Southern Spain and still at their grandest in Seville, the processions have been overshadowed elsewhere by a common misconception that the nazareños, those participants who dress in pointed hoods by way of penitence for their sins, and who march along silently holding candles alongside the huge tronos (floats) are, or at least resemble, the dreaded Ku Klux Klan. It’s true that the resemblance is uncanny, but that is where the resemblance ends. The sanctity and purity of these stunning Spanish spectacles do not deserve to be overshadowed by a hideous clan of bigots who ripped off the costume for their own immoral pursuits. Rather, while the hooded figures of the Spanish parades certainly lend something of a sinister feel to the spectacle, they are integral to the magical solemnity which results. Knowing as I do that the parades are at their biggest in Andalucia, I wasn’t really expecting to find any processions in Mallorca. 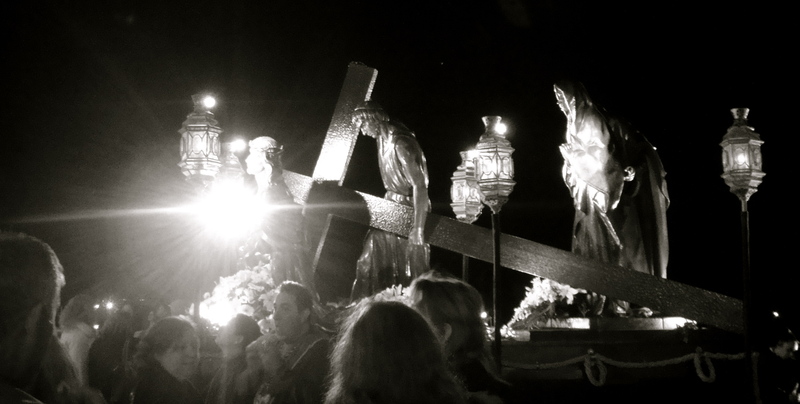 However, as we ventured out for dinner on our first night, the very familiar drum beat of a Semana Santa procession began to ring in my ears, and as we approached our pre-designated restaurant, we met, by sheer coincidence, a procession just as it passed through the very same street. 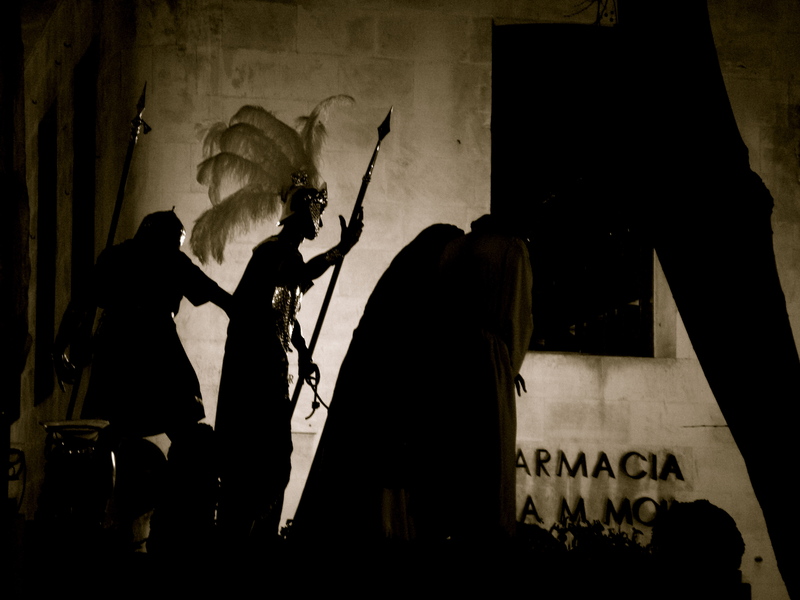 The processions in Mallorca are smaller than the Andalucian affairs, but lose none of their power as a result. This is created largely thanks to the brass bands which play stirring, chromatic melodies which are enough to bring tears even to the eyes of even the most hardened atheist. Meanwhile, the pointed nazareños amble slowly along, burning a passage of candles as they process, and behind them, a life-size statue, normally Jesus or Mary, is carried along on a trono (throne). In Andalucia, these are carried by a number of men baring the huge weight of both the statute and its often elaborately gilded platform. Here I was interested to see that the tronos were carried by men actually hidden underneath the platform, and surrounded by curtains, so that all that could be seen of the men were their feet making the painstaking journey through Palma’s streets. These powerful processions are not easy to capture on camera, being that it is often dark, and the parades are always moving. However, I managed to take a few shots which I feel encapsulate the atmosphere and pomp of these wonderful spectacles. Testament to their rich tradition, and also by way of building in further atmosphere, I have taken these shots in black and white, something which I feel really lends itself to the solemnity and distinctive quality of the occasion. Without further ado, I leave you with a gallery of shots. Beautiful. I wish i could see this. I never had much patience for religion but I can always appreciate the spirituality and I think you captured that beautifully here.